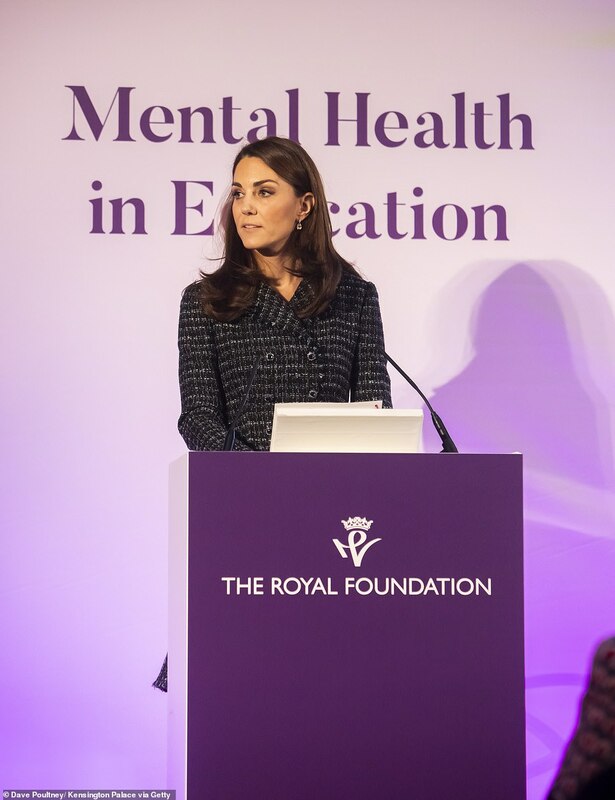 The Duchess of Cambridge called for more support for teachers and students during The Royal Foundation’s ‘Mental Health in Education’ conference in London today. 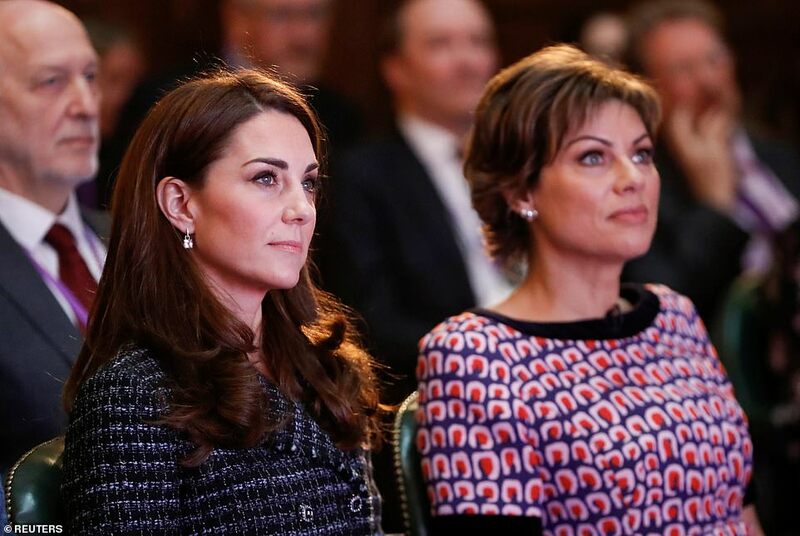 The event, hosted by broadcaster and presenter Kate Silverton, saw a full day of speakers, panel discussions and breakout sessions. Introducing the Duchess today, Silverton said: ‘As you all know (she) has been a great driving force behind much of the royal foundation supporting children in their earliest years. Addressing the crowd she said: ‘It’s really so exciting to hear everyone here speaking with your wealth of experience about the importance of mental health and particularly the emotional development of our children and teachers. ‘What we have all been discussing here today really brings to light the vital role teachers are playing in supporting our youngest children’s mental health. Thank you all for your dedication to this important cause, whether you work in schools, universities, charities or elsewhere. Over the last eight years working with charities I’ve met some of our leading experts in mental health, addiction, family breakdown, homelessness and education. They have taught me over and over again that the root cause of so many of today’s social problems can be traced right back to the very earliest years of a person’s life and often over generations. And as we have heard today, it is therefore vital that we support teachers with their own wellbeing so that they can find the best level of care for all children, in their schools and communities in which they work. No one of us however can make a difference alone. Kate looked prim and proper for her engagement today, wearing a new ensemble today in the form of a bespoke black tweed skirt suit by Dolce & Gabbana. 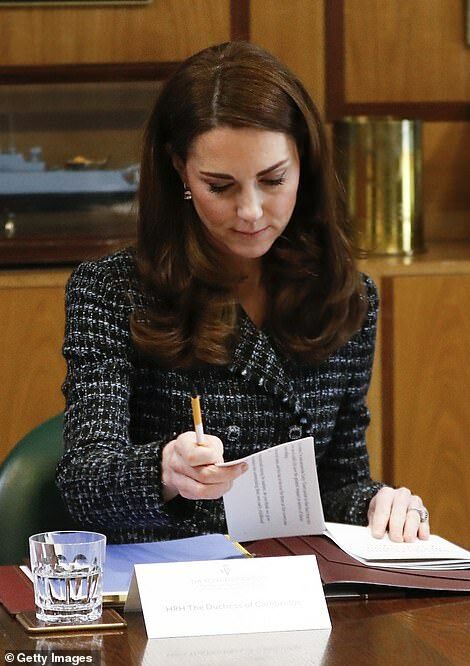 Kate’s hair had been blow dried to perfection for the occasion with her signature brunette locks looking especially bouncy this morning. 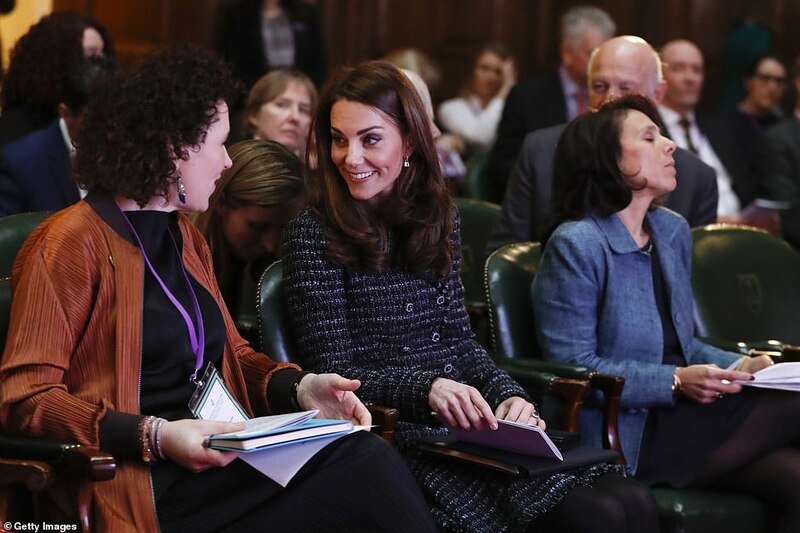 Her Royal Highness listened to a number of sessions, including one on the benefits of integrating mental health modules into teacher training courses, and another on the role of school leaders in creating a culture of wellbeing in schools. 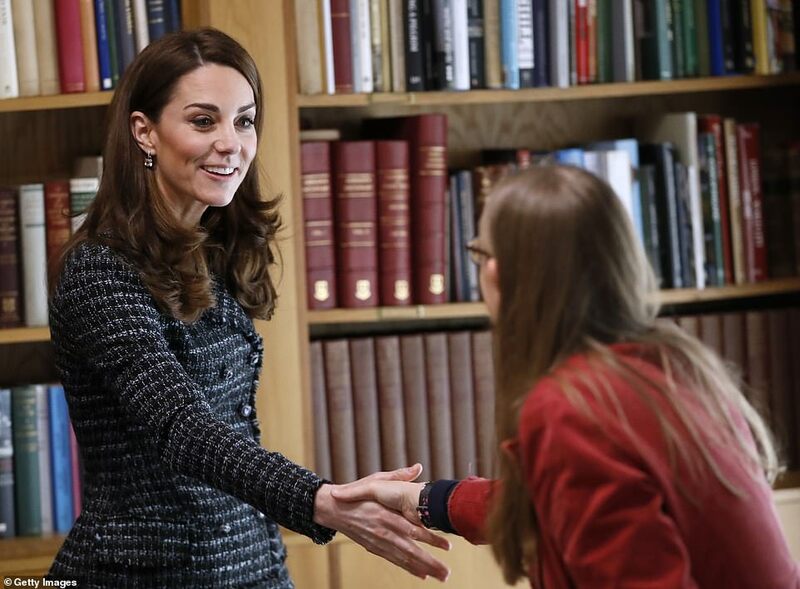 During her visit, The Duchess of Cambridge met with Head Teachers from a number of schools that are currently piloting The Royal Foundation’s ‘Mentally Healthy Schools’ programme. 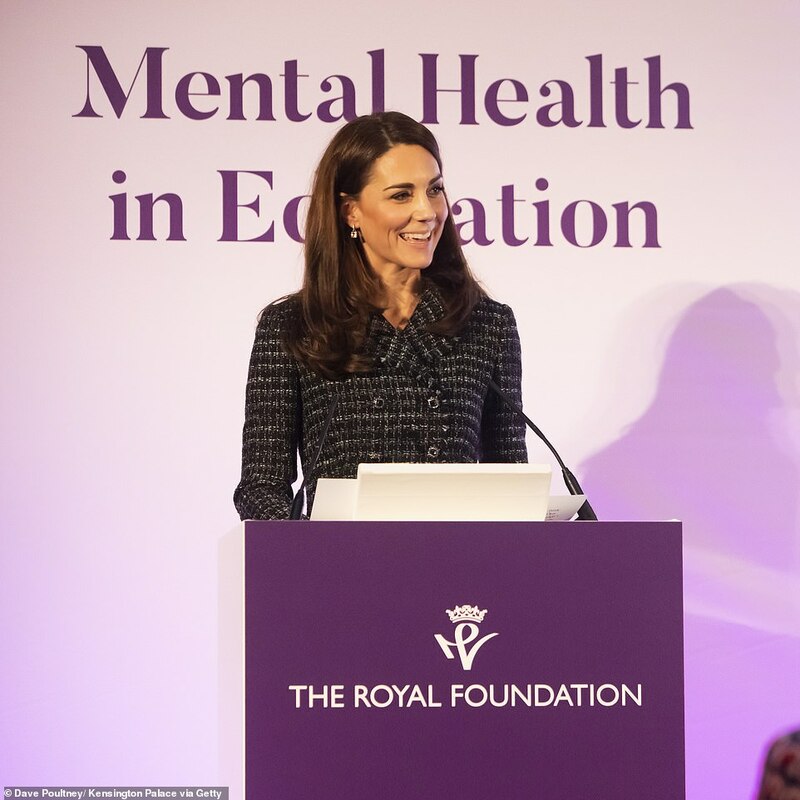 Launched by The Duchess of Cambridge in 2018, ‘Mentally Healthy Schools’ is a website giving primary schools free access to hundreds of the highest quality mental health resources, helping teachers better support their pupils’ mental health. It is one of the legacy programmes from the Heads Together campaign and is being delivered in partnership with The Anna Freud National Centre for Children and Families, Place2Be and Young Minds. 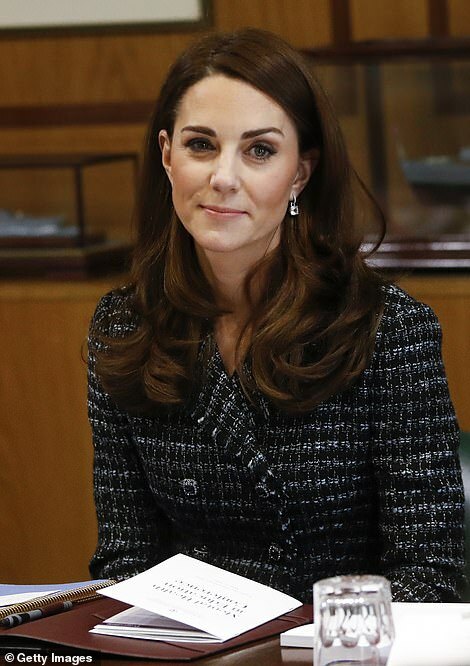 Kate will then join a meeting with teachers and specialists from the sector to further discuss the potential impact of consistent mental health teacher training, as well as the challenges facing its implementation. 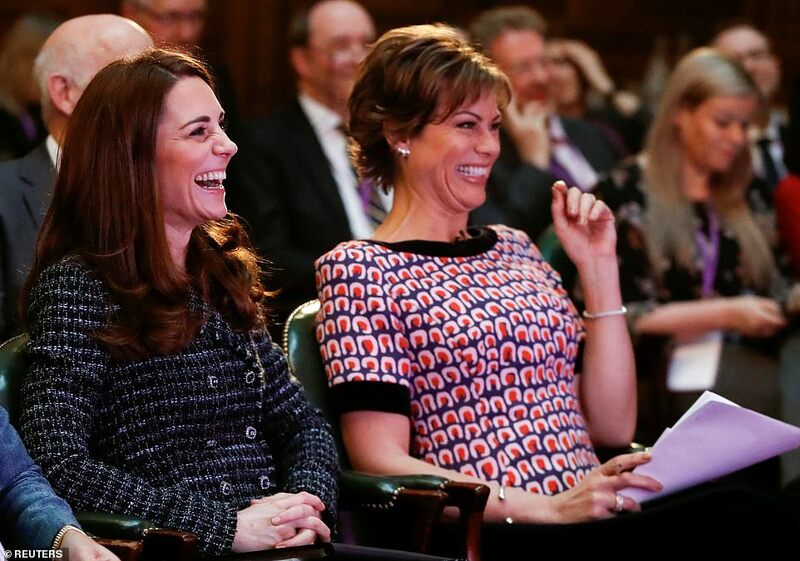 This event forms part of The Duchess’ continuing work at The Royal Foundation, where much of Her Royal Highness’s focus is on supporting and promoting the mental health of children and young people. Kate’s engagement comes a day after her sister-in-law Meghan stepped out in a chic Calvin Klein ensemble as she and Harry visited the Natural History Museum amid reports of disputes with the Markle family. It was the first time Duchess of Sussex had been seen in public since her father, Thomas Markle Sr, revealed the contents of a letter written by Meghan last summer in which she accused him of breaking her heart ‘into a million pieces’ by giving interviews to the press, fabricating stories and publicly attacking her new husband. Earlier this week the Royal Horticultural Society unveiled the Duchess’ designs for her garden at the Chelsea Flower Show which aims to promote mental well being. The Duchess created her garden with Davies and White from Davies White Landscape Architects, and the Royal Horticultural Society. Other members of the Royal Family are understood to have contributed ideas. To go on show at Chelsea in May, the garden will ‘highlight the benefits of the natural world on our mental and physical wellbeing’, according to Kensington Palace. The aim is to ‘get people back to nature’ and encourage them ‘to create new experiences in the great outdoors’. Elsewhere the Duke of Cambridge paid a visit to the homeless charity The Passage shortly after being announced as its patron. 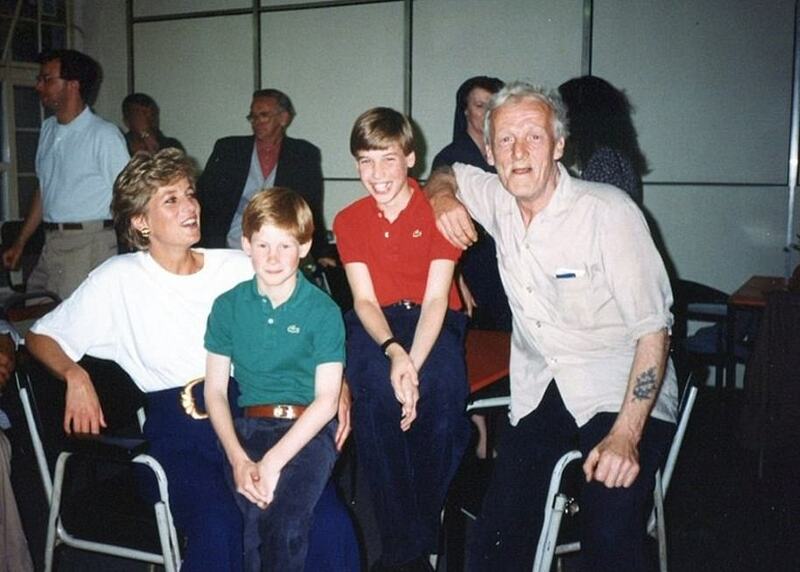 William first visited as a young boy with his mother Diana, Princess of Wales and has now become the figurehead. He visited the charity today where he joined volunteers in the kitchen to help prepare and serve lunch to those in need. The organisation has helped more than 130,000 people in crisis over almost 40 years through its resource centre, homelessness prevention projects and innovative accommodation services. Diana took William and younger brother Harry to the charity in December 1993, and as a young man William has made numerous public and private trips to the organisation. Cardinal Vincent Nichols, head of the Catholic Church in England and Wales and patron of The Passage, welcomed the announcement ahead of the duke’s visit to the charity’s St Vincent’s Centre in Westminster. He said: ‘I know the duke is deeply committed to working with those most in need, such as the thousands of people The Passage has helped off the streets. 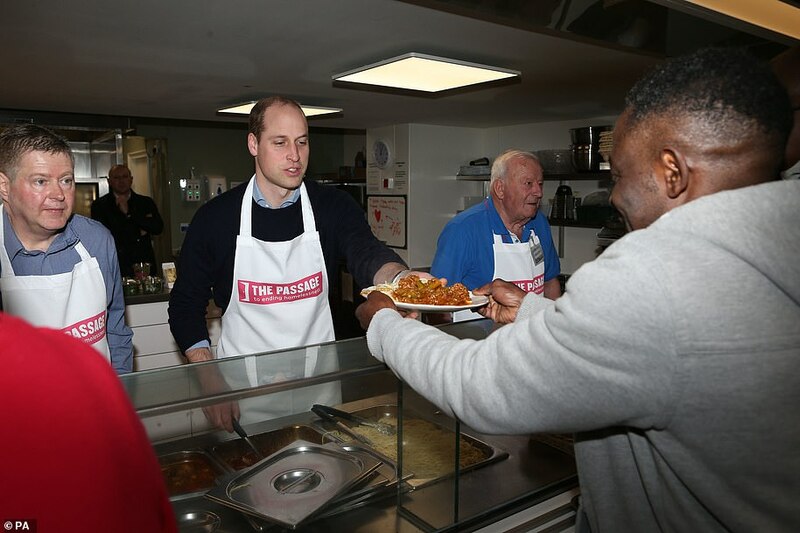 William last visited the St Vincent’s Centre with wife Kate in the run-up to Christmas, when he spoke out against the drug spice after hearing about its devastating effect on the capital’s homeless. The synthetic drug is seen as the biggest challenge the charity faces as it is cheap, readily available and can exacerbate existing problems like poor mental health. Following the announcement Mr Clarke said: ‘During His Royal Highness’s visits to The Passage, it has been very clear that he has a deep concern for those affected by homelessness and a real interest in our work. 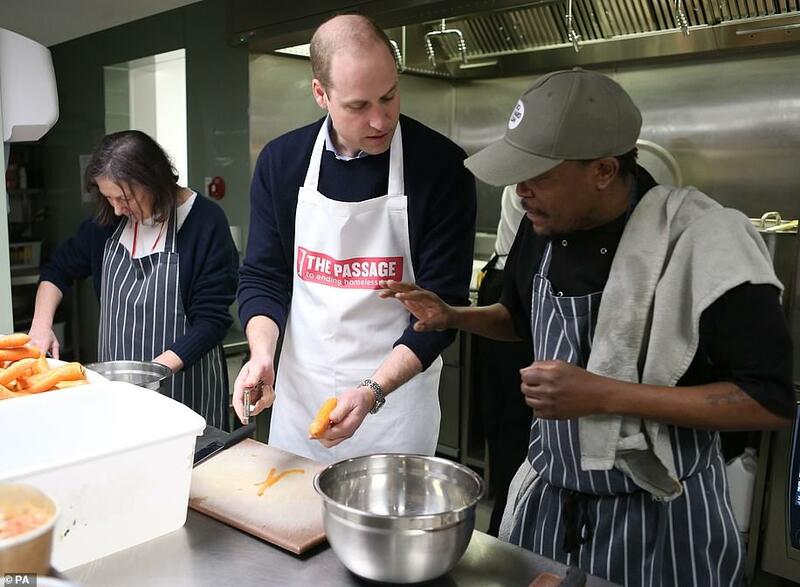 Later William will join volunteers at the charity helping to prepare and serve lunch in what will be the first of several engagements for the Cambridges.